GiftProse has a wide selection of wine gifts and gift baskets. If youâ€™re ramping up to attend a housewarming party or some other gathering at a friend's or coworkerâ€™s house, the age-old question remains: what do I bring? This question holds particularly true if you are attending a work event where youâ€™re really aiming to impress your hosts. A bottle of wine is a typical go-to gift, and the right bottle can be a nice gesture, but if you arenâ€™t a wine connoisseur, simply setting foot into a wine or liquor store can be immediately overwhelming. If your host prefers beer, carrying in a case may be appreciated, but it certainly doesnâ€™t look very pretty. If youâ€™re trying to make your present extra special, youâ€™ll need to up the anteâ€”and thatâ€™s where a wine or beer gift basket from GiftProse can really come in handy. Champagne Fruit Gourmet â€“ Fresh fruits to complement a bottle of champagne. Glorious and Golden â€“ Oaky chardonnay with delicious delights, including tea cookies, cheese, chocolate fudge and Biscoff cookies. T'rrific Snacks for Dad â€“ Sierra Nevada microbrews with golf accessories and snacks, including roasted almonds and pretzels. Beautiful bows are often used to accent these baskets, and the basket itself can typically be reused around the house, either as decoration or as a functional holder of something handy. 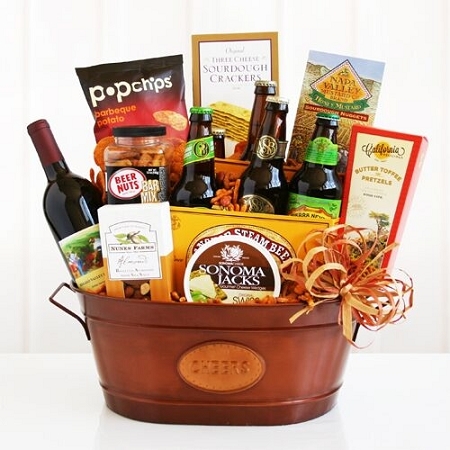 The best part is that our beer and wine gift baskets are often more reasonably priced, so you can make a great impression without a corresponding gigantic dent in your wallet to show for it. 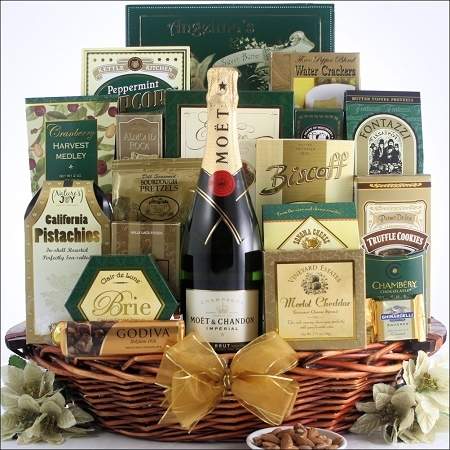 Order a gift basket today by contacting us at 866-933-GIFT.